Thank you for visiting us online!! We look forward to helping you with any and all your Electrical, Plumbing, Housewares, Builders, Tools, Fasteners, Paint Sundries, Lawn & Garden, Fan, Air Conditioner, Heater, Appliance, and HVAC part related needs! 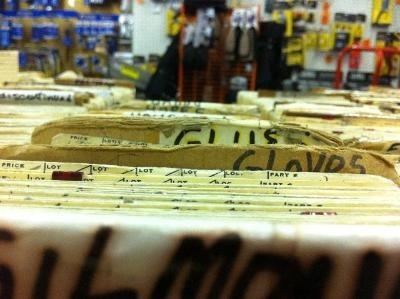 We have over 35,000 items laid out on over 1.3 miles of shelves. It's impossible to list them all, so come visit us to see it first hand. Ankeny Hardware has been in business for over 100 years! 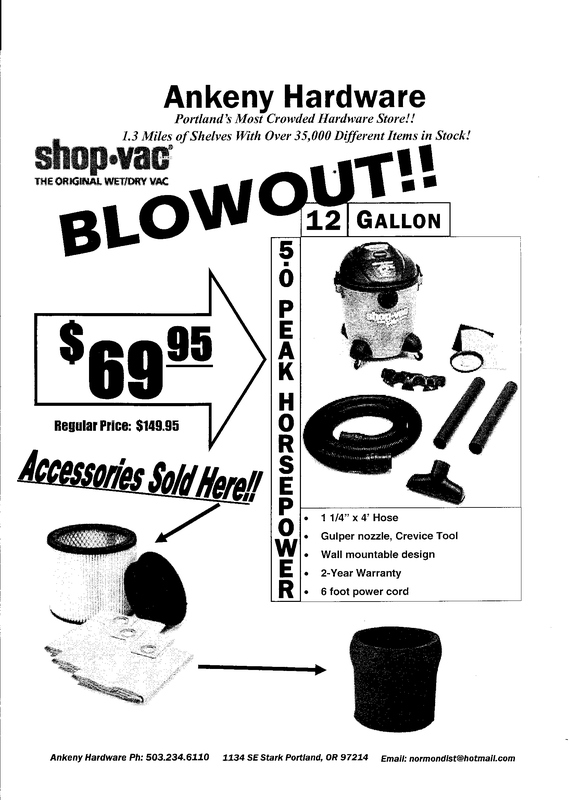 We like refer to ourselves as Portland's Most Crowded Hardware Store and we definitely live up to the name. We have quite a story, so feel free to visit the "About Us" section below to hear more about what makes Ankeny Hardware so special! You can reach us by phone at: 503.234.6110 or by email at: normondist@hotmail.com. We look forward to speaking with you!! We are located at: 1134 SE Stark St. Portland, OR 97214. Please see the "How to Find Us" section below for maps/directions. Klein, General Tools & Instruments, Channellock, Irwin, Lenox, Red Devil, Estwing, Johnson, Vaughan, Mayhew, SOG, Crescent, Gilmour, Stanley, Master Lock, EZ-Flo, Coleman, Shop Vac, NorWesCo, & much...much more!! Norwesco is one of the many products we are proud to carry. We have everything from garbage cans to watering cans and tubs to venting/ducting. Let us know how we can best serve you in getting whatever galvanized-ware you need!! 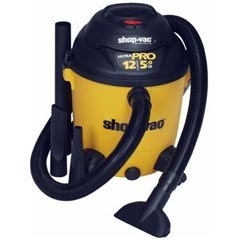 Right now we have special pricing on select models of Shop Vac Wet/Dry Vacuums!! Click the links below to find out more!! 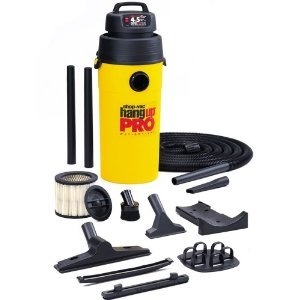 We also stock a full line of filters and accessories! 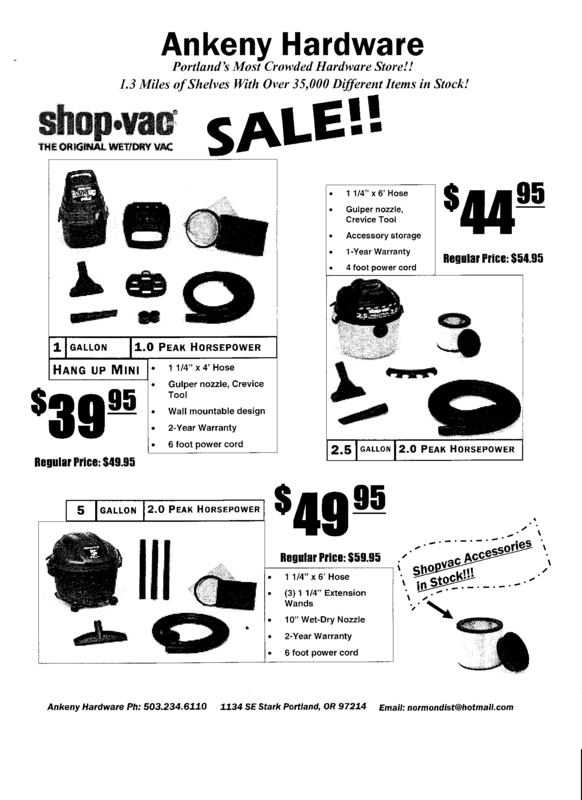 Shop Vac Promotion for a LIMITED TIME ONLY!! Walking into Ankeny Hardware is sort of like taking a step back into the 1950's. We do our very best to sell products MADE in USA, have a depth of knowledge about those products, and provide the best customer service you can find anywhere!! Ankeny Hardware is a 3rd Generation, locally owned, completely independent business with a rich, rich history. We are located in Portland, OR on the corner of 11th & SE Stark St. The store is on the South side of the street. There are garbage cans and wheel barrows out in front of the store on the sidewalk by the entrance door and our large seasonal display window. We have included a map below to be as helpful as we can.